↑ 1.00 1.01 1.02 1.03 1.04 1.05 1.06 1.07 1.08 1.09 1.10 1.11 "Bill DeMott". Online World of Wrestling. สืบค้นเมื่อ 2009-03-05. ↑ 2.0 2.1 2.2 2.3 2.4 "WWE profile". ↑ 3.0 3.1 "UNDER THE MICROSCOPE - 8/10 WWE Raw: Girl in the cafeteria vs. Festus, Solution to Big Show's bad breath, Lawler and the Color Purple, A closer look at G.I. Bro, but not Major Gunns". Years later, as The New Blood fought the Misfits in Action in WCW, the MIA had an unlikely recruit as Booker T reverted back to his G.I. Bro name and look. The Misfits were led by Hugh Morris, now known by the name Hugh G. Rection. ↑ 4.0 4.1 "Nitro report on May 15, 2000". ↑ Shields, Brian; Sullivan, Kevin (2009). WWE Encyclopedia. DK. p. 31. ISBN 978-0-7566-4190-0. 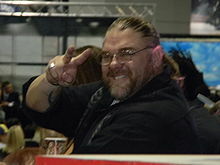 ↑ "WWE News: Bill DeMott resigns, interim replacement (updated)". f4wonline.com. สืบค้นเมื่อ 6 March 2015. ↑ "Heavy allegations levied against WWE's Bill DeMott, WWE's official response". pwinsider.com. สืบค้นเมื่อ 4 March 2015. ↑ "Second letter of allegations against WWE's Bill DeMott leaks online, Chris Jericho, EC3, others comment on situation". pwinsider.com. สืบค้นเมื่อ 5 March 2015. ↑ "WWE News: Developmental head trainer is under fire again". prowrestling.net. สืบค้นเมื่อ 4 March 2015. ↑ "AWF World Heavyweight Championship history". ↑ "HWA Tag Team Championship history". ↑ "PCW Heavyweight Championship history". ↑ "Pro Wrestling Illustrated Top 500 - 2001". Wrestling Information Archive. Archived from the original on 15 May 2011. สืบค้นเมื่อ 2011-04-05. ↑ "W*ING World Heavyweight Championship history". ↑ "W*ING World Tag Team Championship history". ↑ "General Hugh G. Rection's first WCW United States Heavyweight Championship reign". ↑ "General Hugh G. Rection's second WCW United States Heavyweight Championship reign". ↑ "WCW World Tag Team Championship history". Wrestling-Titles.com. สืบค้นเมื่อ 2011-05-01. หน้านี้แก้ไขล่าสุดเมื่อวันที่ 7 กันยายน 2559 เวลา 23:02 น.